Before living at Dunrovin, it never occurred to me that I would form such a strong association and love for a family of birds of prey. It’s not that I had never before seen these magnificent creatures in the wild. After all, I lived in Alaska for over twenty years, where much of my time was spent in the backcountry. I witnessed incredible displays of aerial virtuosity – golden eagles swooping down on the skirts of Mount Denali to catch small mammals; big horned owls silently prowling the deep, dark and foggy spruce forests along the coast of Kodiak; and scores of bald eagles fishing the wintry waters of the Chilkoot River. While their beauty stunned my heart, I did not embrace those birds as individuals. They were there, and I was here. They were a fleeting part of the dramatic wilderness diorama that is so critical to my sense of the world. They played no real role in my daily life. When I did have occasion to see one up close, the relationship was always defined by scientific inquiry. They were a part of the ecosystem that I, as a biometrician and an employee of a natural resource management agency, thought of primarily in terms of populations. Individuals were not our focus – we sought to conserve populations. And while we radio tagged and marked individuals, they were simply representatives of the whole. They came into my life as numbers on a data sheet to be entered into a computer for analysis. This was important work, critical to ensuring that humans understand and respect the needs of other species with whom we share the planet – but it was not sentimental work. I was taught to keep my emotional distance to ensure the impartiality that is a central tenet of science. So it was when my husband and I bought our little slice of paradise along the Bitterroot River that had, for years, hosted an osprey nest. I was delighted. But, I was equally delighted by all the wildlife the river routinely brought to our door. I did not set the osprey apart. I did not understand the enormous gift it was to be living in such close proximity with the nest and how the years of hearing, feeling, and watching an osprey family throughout their daily lives would impact my own life. I have come to completely integrate the osprey family into the seasonal rhythm of Dunrovin. Their movements and activities define the coming and passing of summer and form the basis of our annual guessing games. The tension mounts as I become obsessed with wanting the osprey safely back home in “our” nest. Binoculars and spotting scope come out to verify. Next, our countdown focuses on first flights. It was a first flight that first made me see these birds as sentient individuals, like myself. I was in our pasture when this chick came careening out of the nest right past me – and I am certain that its eyes were filled with that “Oh Sh#t!” look that betrays the bravest of souls who have launched themselves into a new and dangerous endeavor, only to find it much harder than anticipated. My heart raced as I watched the chick struggle to gain some altitude and perform a less than perfect landing back on the nest, where it remained the rest of the day. I was no longer an impartial scientific observer; I was a surrogate mother holding my breath for the chick’s safety. Now that we have a web camera installed over the nest, my relationship with the birds has only intensified. Our guessing games may have changed a little –we can see the number of eggs in the nest; but the sense of anticipation is just as intense, and the sense of familiarity is greatly heightened. You cannot watch their intimate comings and goings and fail to recognize your own family dramas. 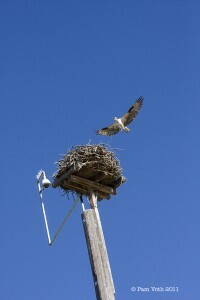 Our web camera means that you can share in the wonder, awe and humanity of living with this glorious family of osprey. It is my great pleasure to welcome you to Dunrovin Ranch and to connect you with Ozzie and Harriet, their chicks and their bird’s eye view of Dunrovin. We will try to keep you updated with scientific information about osprey and the highlights of Ozzie and Harriet’s activities – but it is only through watching them and being in the moment with them that you will come to embrace them as neighbors who live in the nest. Have some fun participating in our annual guessing games and catching glimpses of the human and horse activities that Ozzie and Harriet watch daily at Dunrovin, from weddings to horse soccer. As you get to know them (and us) may you, too, hold your breath with every chick’s first flight. Visit us on Facebook to comment and converse with others from around the world who are also watching, and please consider making a donation to help Dunrovin and the UM maintain and improve the osprey webcam so that we can broadcast these beautiful birds to even more people.